Mother’s Day is a wonderful day to remember your grandmothers too! Although moms who are in the trenches with their young children should still be able to enjoy their relaxing breakfast in bed, take time during the day to celebrate all moms this holiday. Flowers, Candy, and a Card. Remember that your grandmother may have limited space. Many seniors are trying to declutter or downsize, so gifts that are perishable are often appreciated. Purchase her favorite chocolates that she might not buy herself or gather a bouquet of her favorite blooms to brighten her home. Photographs. Print out photos of her and her grandchildren and frame these for her home or to share with her friends. She will adore being surrounded with smiling images of those she loves. Afternoon Tea. Either make a reservation at a local restaurant or break out the fine china at home, a lovely afternoon tea with finger sandwiches and scones can be a wonderful way to celebrate Mother’s Day. If you have small children, this is a great occasion for them to practice their best manners at the table. Pinkies up and enjoy an indulgent afternoon together. A Movie Matinee. Is there a new comedy or adventure movie that Grandma would want to see? Or perhaps bring the grandchildren and enjoy a fun children’s film together. No matter what you see, indulge in some favorite candy, popcorn with butter, and an iced drink. Manicure or Pedicure. Get dolled up this Mother’s Day by treating Grandma and Mom to manicures or pedicures. Elderly parents sometimes find it difficult to groom their feet or poor eyesight may make this task more difficult. Make her feel glamorous this holiday with beautifully painted nails. Contributions to Her Favorite Charity. Perhaps you don’t know what to get someone who has everything, or you do not live in the same city as your grandmother, a donation to her favorite charity can be a very thoughtful gift. Enjoy the Great Outdoors. 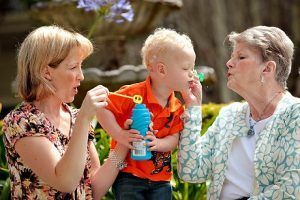 If you are lucky enough that your Mother’s Day has good weather, take the grandchildren to the local school to play, take a long nature walktogether, or enjoy ice cream in the park. Fresh air and spring sunshine will melt away the thoughts of winter. Grandmothers deserve to be honored on Mother’s Day. Carve out time to celebrate your elderly mother or grandmother on this day—a holiday that can be even better when shared together! Visit any of our Aegis Living communities on Mother’s Day or any holiday to see how we celebrate our residents.